Opened in March 2011 and is the home of both the TCI Rugby Football Union, and the TCI National Rugby team, the Flamingos. 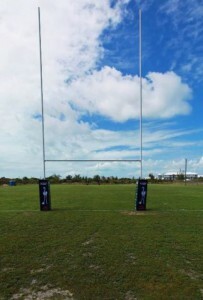 Located in the heart of the Village of Grace Bay on the island of Providenciales, this purpose built rugby field is developing into one of the premier rugby stadia in the Caribbean. Featuring an underground irrigation system, clubhouse facilities, field lights and ample parking Meridian Field is privately owned by the TCIRFU. Initially conceived as a venue back in 2000, this 3 acre parcel of land was leased at a peppercorn rental to the TCIRFU under the premise that a rugby field and clubhouse would be developed on the site. Due to funding limitations progress was slow but gradually over the years thanks to a lot of hard work by a small cadre of volunteers the field began to take shape. Countless local contractors and businesses have given generously over the years assisting with the creation of the field; from initial grading of the site, MEP work, through to construction of the underground cistern and pumphouse. Progress was always restricted by funding, due to the sole source of funding being fundraising activities by the TCIRFU, or generous donations by philanthropic parties. Still the field started to take shape, slowly but steadily. In 2010 the project received a major boost with the granting of an interest free loan from Meridian Trust Company Limited to help complete the ground. This new funding saw the completion of the perimeter fence, the activation of the irrigation systems, acquisition of goal posts and post pads, and the installation of field lights as well as the laying of the grass seed. After ten years of hard labour, sweat and tears, the ground was finally opened in 2011 and the inaugural match at Meridian Field was played. The game against the Bayonne Bombers drew a large crowd who delighted in seeing the TCI Flamingos run away with the match and establish an unbeaten record at their new home. The large turnout produced renewed enthusiasm to get the clubhouse finished, and in May of 2011 construction began on the final stage of the clubhouse. It is all but finished now, and with only some small adjustmensts still to be made, is expected to be officially opened sometime in 2012. In August 2012, the TCIRFU was granted final legal ownership of the 3.12 acres in Grace Bay on which Meridian Field sits. As such, the TCIRFU is the first Union in the Carribean that actually owns its own field and is proud to have under its control one of the premier rugby facilties in the region. 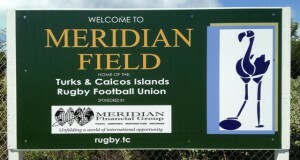 Meridian Field is the home of rugby in the TCI, and the TCIRFU expects to see many more matches played there over the coming years as the game develops and grows in this beautiful part of the Caribbean.